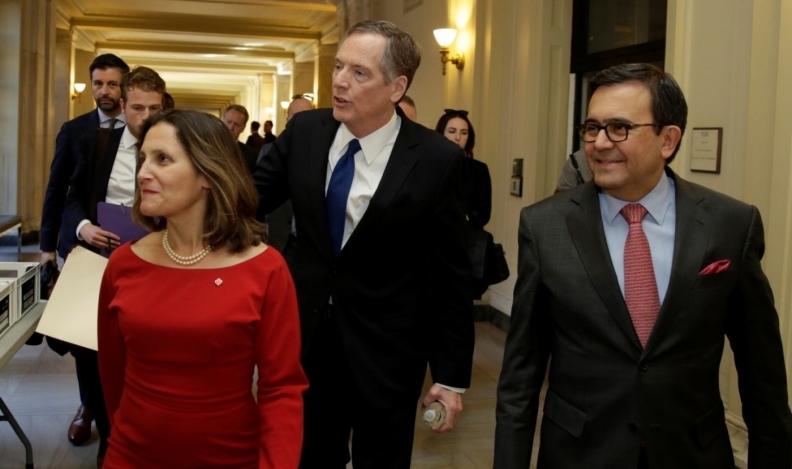 The U.S., Canadian and Mexican ministers driving talks to modernize NAFTA will meet in Washington this Thursday, but no announcement is expected from the talks, a Canadian government source said on Tuesday. Although the United States is keen to quickly wrap up negotiations to update the US$1.2 trillion North American Free Trade Agreement, officials say major differences remain. Teams of trade experts from the United States, Mexico and Canada have been meeting for weeks to try to narrow their differences on NAFTA, and Mexican Economy Minister Ildefonso Guajardo said a total of 10 chapters of a revised deal were now concluded or virtually settled. But he did not expect major announcements on Thursday. “Thursday is about starting to work through the list of issues pending. The truth is the horizon going forward is a horizon of a couple of weeks,” Guajardo told reporters. “I think you need to be alert that if there’s going to be rabbit for the stew, it’s going to be at the end of April,” he added, without being more specific. Guajardo and others have said a NAFTA deal could be possible by early May, but significant differences remain on U.S. proposals to revise content rules for the automotive sector, change dispute resolution mechanisms and other issues. Over the past few days, the technical teams had, barring some “tiny details,” finished work on chapters including telecoms, energy and technical barriers to trade, he said. U.S. President Donald Trump has driven the renegotiation of NAFTA, arguing that the deal has hollowed out American manufacturing to the advantage of lower-cost Mexico. Trump has threatened to use other measures, such as slapping import tariffs of 25 per cent on steel and 10 per cent on aluminum, to gain leverage over Mexico and Canada in the NAFTA talks. Both countries have been initially exempted from the tariffs.